The Downtowner on Lygon is an award winning hotel nestled between inner city Carlton and the Melbourne CBD. In addition to luxury hotel suites, the venue offers a restaurant, cocktail bar and function and conference facilities. Ecovantage was engaged by the Downtowner to upgrade the lighting throughout the venue to energy efficient LED lights. We worked closely with Chief Engineer, Peter Nesbit, to provide a custom solution to suit the diverse requirements of each area of the hotel. It was especially important to maintain the charm and character of the building as this is a key attraction for the Downtowner's clientele. This meant retaining some of the older light fittings and designing a retrofit solution to accommodate them. "Ecovantage has been instrumental in achieving the correct results in different areas of the hotel which is very important to produce a nice ambience for our customers so they enjoy their stay. Nathan O’Halloran sourced different retrofit fittings that take the modern LED tubes and downlights etc and blend them in to our older styled building." The lighting upgrade included replacing the halogen downlights and fluorescent tubes in the guest bathrooms with 10W LED downlights and 18W LED tubes above the mirrors. This resulted in better quality illumination than the guests enjoyed prior to the upgrade. Energy usage in the car park was slashed with each fluorescent fitting containing 2 x 36W tubes being replaced with 1 x 20W LED tube while still meeting the Australian Standards for car park lighting. The upgrade also extended to the function rooms, restaurant, bar and foyer where the LED downlights were carefully selected so they worked reliably with the existing dimmers. The hotel currently maintains a NABERS rating of 4.5 stars (the highest NABERS rating of any hotel in Australia). Given the recent lighting upgrade, they are very confident of achieving a 5 star energy rating in March 2016. 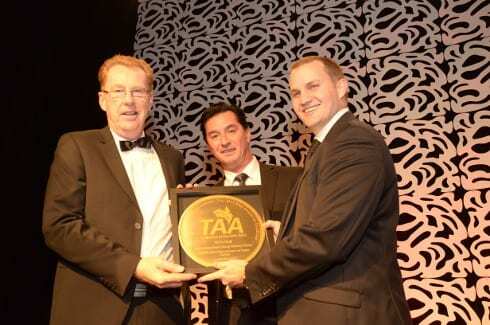 The hotel has won the Tourism Accommodation Australia (TAA) Environmental and Efficiency Best Practice award back to back in 2015 and 2016. This is a fantastic result considering they compete against much larger hotels in the category. After the success of the first upgrade, the hotel is now completing an external LED lighting upgrade on the balconies which will again improve the lighting for the guests and mean significant energy savings for the hotel. "Overall, we are very happy with the quality and ambience the new LED lighting upgrade has delivered." Overall, the upgrade involved installing a total of 213 LED tubes and 415 LED downlights. Due to the significantly lower wattage of the LED lighting, the hotel has reduced their energy consumption from lighting by a massive 78%.